I had to do something to deal with my ongoing chronic back pain. Travel was becoming so difficult I was canceling trips, I could no longer do yard work I enjoyed and – frankly – the boundaries around me started to get bigger and bigger. I knew I had relief from lying on the floor and putting my legs up on a couch for a minute, but it bothered my back in other ways. I had tried an old style Slant Board but internet searches showed that no one was making them anymore. Hey, I will make one myself, I thought! It seemed so easy and obvious when we started the Gravity Pal project. We would hire a craftsman and tell him what we wanted and, spending very little money (we thought), would have one in no time. After a couple of years, over 50 prototypes and dozens of refinements and false starts we finally figured it out. And then I had this thought: “OK, here is how you do it”; acknowledging, that there will always be those that insist on paving their own way. And, with that, here is how you do it. First, you study the physiology and become familiar with biomechanics, how the Central Nervous System functions and – most importantly – how the human physiology reacts to different forces, like Gravity, for instance. 2 ½ yards of vinyl – Out of dozens and dozens of options try to get the right thickness or you will slide off of it or it will bunch up on you. Foam thick enough to your liking – Note: there are many kinds and thicknesses to choose from. Some are very hard and some so soft you won’t feel them at all. Pick a plywood as a base. How thick you use will determine how heavy and strong it is. Some are super heavy and some are so cheaply made that the out-gassing will give you headaches. Oh, and know that some of them, like Baltic Birch, are beautiful and superb but super expensive. Bracing wood so that the span of plywood does not bend in the middle and create a hammock effect when you lay on it. This is critical; otherwise you create BAD pressure points along the spine and neck that will become overloaded with pressure. This will create the opposite effect you want and add more stress to your spine. 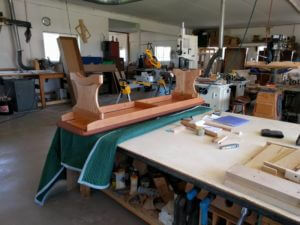 Legs so that you can elevate the finished board to a desired angle. You will want to experiment most with the angle because that is where the “body meets the slant” so to speak. We recommend testing in ½” increments. It takes time but is worth it. Upholstering equipment, MANY tools, many specialty parts, like hard to find Amish Draw Latches (hard to find because the Amish don’t have internet sites and you have A) hear about, then B) send away for a catalogue, and then C) Mail them a check and see if what they send is what you want or not. And a myriad of other what-not specialty cabinet screws and don’t forget the custom made metal legs and other metal parts. Finding someone who can bend, hand drill, hammer and weld aluminum in small affordable quantities is, around here in Southern Iowa, at least, pretty hard to find. The above list is a good start, BUT IT IS ONLY A START. If you are handy and persistent (or obsessed with a vision like we are) we predict that, because of the help we have provided above, you should probably spend no more than a few tens of thousands of dollars figuring it out. There will always be people who insist on making their own things, some for fun and some because they truly need to try to spend less money. It is important to look beyond this. For those who enjoy the building process we invite you to please enjoy and go ahead, make your own Slanting Board. If you’re OK with something rough and rustic or you’re looking for a project you think you will enjoy, you may get what you are looking for. Heck, if you make something better, please let us know! 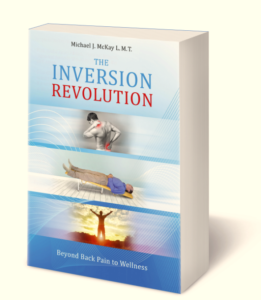 But if you are looking for relief from back pain or are looking for a Self-Care Wellness Tool then you will want more. You will want to benefit from the time, attention and dedication of two licensed massage therapists who have devoted years of study of the physiology and how the angle and physical materials interface with the body negatively and positively. If you want to try something that works very well for many people – AND is remarkably affordable considering all that has gone into it – then Gravity Pal Low Angle Inversion Tables may be right for you. Which one of our models should you consider for yourself? Please go to this short video to look them over. We believe you too will love your Gravity Pal. 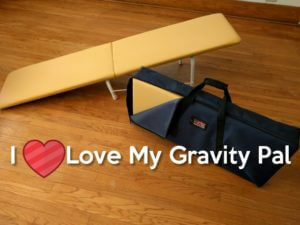 I am super enjoying my top of the line Gravity Pal. I’ve even done a bit of yoga on it with great results! Love it. I additionally take my yoga blocks lay them on either side of the GP, and rest the back side of my hands with my elbows a bit bent, and man, tell you what, super relaxed. Yoga with Gaileee, here in south east Texas (Port Neches/Beaumont area).